The Commission Elections (Comelec) promulgated the prescribed timetable for the conduct of the May 2019 mid-term elections. Under the 1987 Philippine Constitution, midterm or local elections are done every three years for people to select their leaders for the provinces, cities and municipalities. For the synchronized national and local elections, these are conducted every six years with separate schedules for the synchronized barangay and Sangguniang Kabataan (SK) elections. The filing of the certificates of candidacy (COCs) among aspirants for elected positions in the local level, one of the most important activities for the election period, concluded last Wednesday. Now, the electorate have a clear identification of the candidates for the different elected positions in their places. However, this may not be the final list of candidates because the poll body allowed the possible withdrawal of COCs and the subsequent substitution of candidates until November 29, 2018. What is important is that the electorate in the different provinces, cities and municipalities know who are the politicians seeking elected positions whom they will scrutinize in the next six months or so until the scheduled judgement day on May 13, 2019. Prior to the filing period, political alignments and realignments were done to beef up the lineup of the different political parties choosing the possible strongest candidates they can field against other aspirants, including independent candidates. While the list of candidates has yet to be finalized, a number of adjustments are still possible until the lapse of the period granted for withdrawal and substitution to strengthen the bid of politicians to public offices. 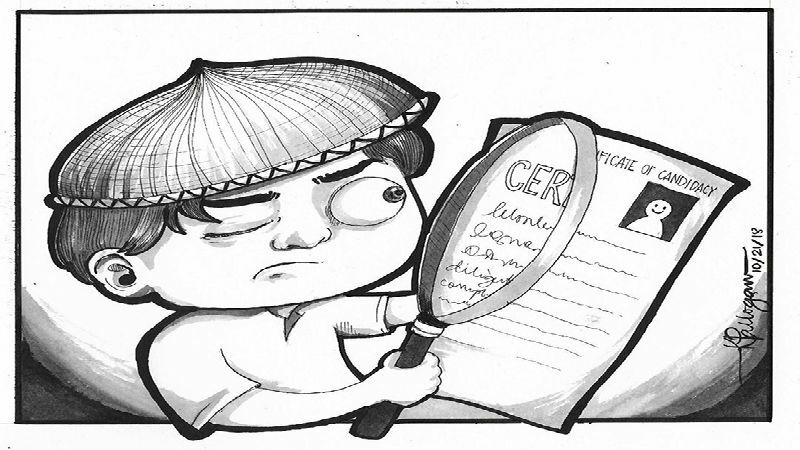 With the required early filing of COCs by the prospective candidates, concerned sectors fear that public service will be compromised in favor of the local officials who are already in power and are seeking re-election or higher positions because their actions, no matter how apolitical, can be construed to advance their election agenda. Since the early filing of COCs was implemented some three elections ago, people have observed almost all officials seeking re-election or higher positions have had the tendency to align their decisions or decide issues to favor votes that will go to them and not on the merits of the case that will support their overall constituency’s well-being and welfare, and for the more strategic comprehensive interests and development of the city, as a city of peoples. The battle has begun among these electoral aspirants and their supporters. Numerous self-serving surveys are now coming out purportedly to show that some candidates are taking the early lead in the race. Mind conditioning by their media spinners is clogging media and public spaces. Vote buying has been reported. Politicians are the greatest actors in the universe because most of what they do, especially during election period, is acting, with apologies to the few local leaders who act according to the rule of law. Vote buying has been a common practice during elections and voters must be circumspect about these actions. Voters must remember that elected officials only receive meager salaries compared to the enormous services they render to the people. It would be doubtful when some of them start distributing items or cash near and during the election period. Sometimes, donors course their donations through the offices of local governments. There had been practices that these sitting politicians stamp their names on these items and distribute them as their personal donation. We can name a lot of gimmicks of politicians which helped them get elected. We know these and this time, voters must be critical of politicians’ electoral agenda and standpoint on critical issues that impact on the people’s long-term well-being. Let us be critical of the performance of the candidates in their private and official businesses, their position on issues affecting the development of the city as a people-centered society, their advocacies for a balanced development for their localities, their priorities in their actions, among others. It is not late for us to shift our support to deserving leaders of our communities. Let us be intelligent electorates by studying issues ourselves and not depend on the mouthpieces of candidates. Let us engage in educational discussions and not depend on electioneering promises. Let us do our homework and understand in full the issues we are facing as a society. We must argue what is right and not to fall in the trap of those individuals having selfish motives on social issues just to take advantage of the situation to advance their own political and personal interests. Some politicians are simply taking advantage of the misfortunes of others to gain popularity even if they only make much noise like empty tin cans around the corner. If we are not critical voters, we get the leader we deserve. Do we allow this to happen?